Did Hitler ever drive ? Did Hitler ever drive a car or any other vehicle? Are there any pictures of him doing so? Did he have a license to drive? I have seen at least one picture of Hitler behind the wheel but sadly my memory of both picture and caption are very sketchy. I don't recall which book it was in (probably one of the biographies I have) but do remember that it was taken in the early to mid 1920's. He was wearing a leather "racing cap", maybe with goggles - not sure-, and seated in a sportscar. If my memory serves me well it was a red Mercedes that was given too him. In later years he seems not to have driven at all but was always driven by a chauffeur/body guard. Hope that helps you along a bit. To my Hitler don't dirive he did not have driving licence. He would have can be led a motor bike during the First World War but I am not certain. He refused to take useless risks because of its function of Fuhrer. Is this the red sports car you remember? I've been looking through the biographies but can't find the picture that I thought I remembered anymore. The story of the red car that was given to him probably comes from John Tolands biography. The one that I lent to someone and never got back , can't check it. I agree he didn't have a driving licence and him not wanting to take any unnecessary risks in later years. But in the early 1920's he took more risks than just driving a car and I don't think not having a licence would have stopped him from driving (if he knew how to drive). May be on the photography steering wheel of the car is on the right like much vehicle in Europe at the time ? It seems that in the Twenties and at the beginning of 30 he made to the race with powerful vehicles met on the road his driver drived to 140 and 160 km/h. If Hiter had lived now it would have surely learned to drive and to swim with the number of swimming pool in increase. Yes it is true I think that it is the driver of hitler which took the photographie. If I do not make error Eva braun had his car and drived. Can anyone inform us about the type of the car on the photo? 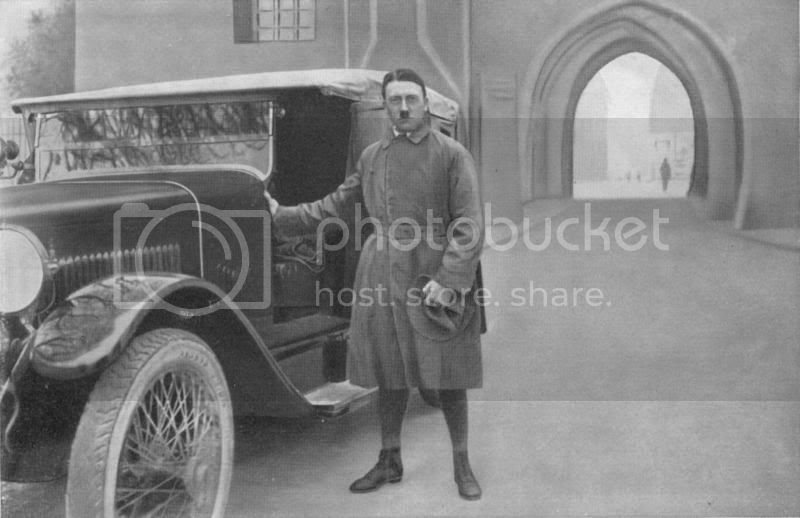 In "Daimler-Benz and it's Nazi history" by Bernard P. Bellon it is claimed that Hitler was picked up from Landsberg prison (where the above pictures were taken) by Jakob Werlin. Werlin was one of the directors of Mercedes and a friend of Hitler. Werlin had also been involved in the 1923 Putsch and Hitler seems to have had some shares in Mercedes-Benz. Assuming that a Mercedes-Benz director would drive a company car I think it's a fair bet that the car is a Mercedes. Looking into this driving businss some more I found a few bits of text here and there that claim that Hitler "took Eva Braun for a drive in his Mercedes on various occasions". Hitler and Braun met in 1930. Would Hitler have his driver present when dating a 17 year old girl?? I don't know but it seems unlikely to me. I read somewhere, that Hitler drive, and he got a ticket for speeding, the day of the Gelli Raubal suicide. TassosTz wrote: Can anyone inform us about the type of the car on the photo? From the design of the radiator, it looks to be a Mercedes, but the exact model would be difficult to determine, as it appears to have "one-off" coachwork to make it an open tourer: possibly a P series, which was introduced just before the Great War and continued into the 1920s. And just to clarify: when this picture was taken, Daimler (who built Mercedes cars) and Benz were separate companies. They merged in 1926 to form Daimler-Benz, the cars being known as Mercedes Benz from then on. Werlin was certainly an early associate of Hitler, but he wasn't appointed to the board of Daimler-Benz until July 1933 - at Hitler's behest. At that time he was the D-B branch manager in Munich. This image I believe is from the 'Deutschland Erwache' photo-album book as well. I must search the copy I own, but I believe this image is for AH release from Landsberg. The car does appear to be a Mercedes, but it has many non-standard features. The radiator shell appears painted, the bodywork could be special, the wire wheels are a special feature, and the lighting does not appear typical of cars for this vintage as well. As well, the emblem of the radiator shell is in the center, which was not practice until Mercedes-Benz merger of 1926. This car appears to be quite modified. I've seen a photograph of Hitler sitting behind the wheel of a stationary car. I think it was when he was inspecting a new car design by Ferdinand Porsche as he is also in the photo. I remember it especially because Hitler has a big grin on his face as if reacting to a joke or humorous statement. The photo below is take from the same event. Probably taken at the 1937 Berlin Motor Show, which was the public launch of the Volkswagen.